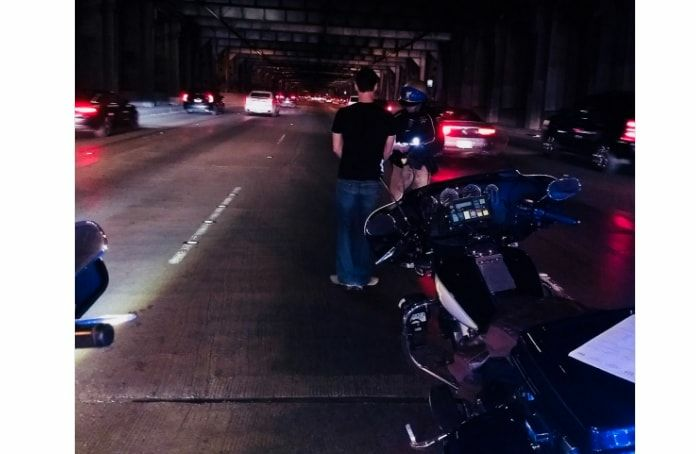 The California Highway Patrol of San Fransisco Tweeted today that a man arrested on the Bay Bridge and charged with suspicion of DUI, woke up (police say he was passed out) and told them his Tesla was on Autoplot. CHP Tweeted, "When u pass out behind the wheel on the Bay Bridge with more than 2x legal alcohol BAC limit and are found by a CHP Motor. Driver explained Tesla had been set on autopilot. He was arrested and charged with suspicion of DUI. Car towed (no it didn’t drive itself to the tow yard)." The photo above accompanied that tweet which can be found at the @CHPSanFransisco twitter address. KRON, the Bay Area News Network, reports that police say the suspect's blood alcohol content (BAC) was over twice the legal limit, presumably based upon their measurement of that BAC. Tesla's Autopilot is a driving aid that requires the operator of the vehicle to maintain control at all times. Despite its catchy name, Autopilot is not a level five autonomous driving technology which, when eventually developed, will allow for the vehicle to operate without driver involvement. Coincidental to this police report, firefighters in Southern California tweeted images this week of a Tesla that had been crashed into the back of a parked firetruck. That driver also reportedly told police that the Tesla was operating on Autopilot at the time of the crash.